In this connection the most common defect is that which results when the first and last molar teeth in the upper and lower row do not exactly cover each other. The upper row may extend a little farther back than the lower one, when a portion of the last tooth of the former, and a portion of the first tooth of the latter, will be out of the line of wear (fig. 121), with the result that the unused parts of the teeth will grow of inordinate length, and sooner or later give rise to difficulty of mastication, and maybe to injury of the gum, or even the jaw-bone. 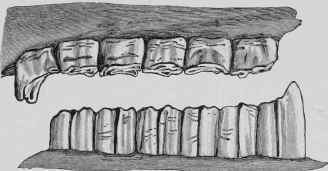 To remedy this defect the projecting portions of the teeth must either be removed with the rasp, or chiselled off with one or other of the various chisels devised for the purpose. Fig. 121. - Overgrowth of Anterior Molar below and Posterior Molar above from want of Contact.